In September 1955 a secondary school opened in Johnstown House which had been purchased by the De La Salle Brothers from O’Toole brothers who where farmers and supplied milk to Dublin Dairies and the local people. Boys attended school here in the morning and girls in the evening. There were a total of 71 boys on the rolls, and three Brothers, who lived in Mount La Salle, were their teachers. By 1956 the roll had increased to 111 pupils. Brother Cyril Healy was the first Headmaster. 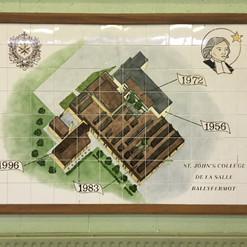 The first of the present school building was opened in November 1957 and was first called Colaiste De La Salle. There were then 140 on the roll and they were taught by four brothers and Mr. Murphy a science teacher. The Brothers moved into Johnstown House in 1962. That year there were just 18 in the Leaving Certificate, while 93 had entered first year. In 1964 free study was introduced at night time because of the difficulty many students had studying in small houses with large families. In 1969 Free Education was introduced by the government and prefabs had to be used to accommodate the growing numbers as the Department of Education refused to pay for an extension. In 1969 an extension, consisting of 8 rooms, was built by the brothers and they received no help from the department. Finally, in 1981 after long drawn-out negotiations with the Department of Education, the main extension, which included specialist rooms like Woodwork, Art, Technical Graphics and science rooms was started. In addition, the extension included a spacious assembly hall with a stage. Classes moved into this state of the art extension in September 1983. It was opened by Brian Lenihan, the then Minister of Education. All the prefabs were finally removed. In 1988 Br. Declan Loughnane became principal and he added the Prayer Room and Home Economics Room as well as a computer room. It was also Br Declan who added the final extension which consisted of three important specialist rooms, as well as changing rooms and a greatly upgraded soccer pitch. Tragically Br Declan died suddenly in 2009. Mr Pat McMorrow was appointed as the first lay principal.He was succeeded by the present principal Ms Ann-Marie Leonard in 2009.She provided the school with a well-stocked library and has completely refurbished the science block. She also had the yard resurfaced and a new computer room opened.